Planning to relocate to Eugene? Then you’re probably asking yourself the all-important question: where in Eugene? Not all Eugene neighborhoods are equal. Where you’ll want to land depends upon many factors. Access to work or school are big ones, of course, but it’s also important to ask yourself: why are you relocating to Eugene? Which particular slice of the Eugene Life are you eager to make your own? We, of course, have our own biases. We’re South Eugenians through and through and thrive on the funky, thoroughly unique vibe of the city’s cultural heart. It’s where we do most of our business and search for many of our clients’ future homes. Speaking of home searches, check out Eugene homes currently for sale or better yet, contact our Eugene office, and we’ll get yours started right away. Anyway, our specific rankings reflect that predilection. But, depending on your preferences, we think almost anyone will find one or two of the following ‘hoods right up their alley. Read on as we take a tour through… the 5 Best Neighborhoods in Eugene. As you head up into hills from the busy streets of southwest Eugene, things start to feel pretty different. The bustle of the city recedes into the background, and the air feels just a little fresher, the scenery just a little more vivid. 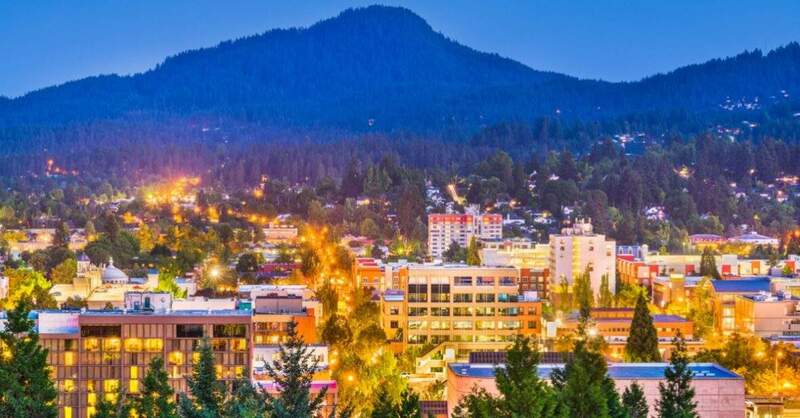 After a busy workday in Eugene’s city center, maybe you’re looking for just that–but you don’t want to be too far away from the action. Well, consider looking for your new home in the Crest Drive neighborhood. Just a few minutes’ drive or a zip down the hill on your bike will take you downtown, to the University of Oregon, or to the shopping and recreation of Southeast Eugene. What’s even better is that being in the Crest Drive neighborhood puts you in launching distance of Eugene’s own wine country. Forget Sonoma County: a growing number of local wineries are putting out wines to rival that region’s finest. Cycling on the Lorane Highway to the north and east of here is excellent, and be sure to check out the Territorial Wine Trail. The fall leaves are simply fantastic. Heavily-treed lots and quiet, winding streets predominate, and deer and wild turkeys are frequent visitors. Two-story, 1970s-vintage homes predominate, and prices are around average relative to the rest of Eugene. If you’re looking for newer developments in similar environs, consider heading west to the hills above the Churchill neighborhood. It’s definitely not for everyone. But if you’re relocating to Eugene for its unique culture, look no further. Here, you’ll find inspiration and perhaps altered consciousness among some of the city’s most out-there artists, musicians, visionaries, and radical thinkers. With a colorful cast of characters walking these streets at all hours of the day and night, you won’t have to go far to find stimulating conversation or inspired creative expression. After all, you are in the birthplace of Ken Kesey and his merry band of pranksters. Take a walk around the block anywhere in the vicinity of 3rd of Blair, and you’ll see right away that you’re not in Kansas anymore. Community murals featuring shamanic and psychedelic-induced visions proliferate, and the telltale aroma of cannabis is never too far away. There are plenty of dispensaries, obviously, but to overemphasize cannabis’ role here would be to sell the Whiteaker short. Some of Eugene’s best restaurants, cafes, breweries, and organic grocery stores are right here in the thick of things. Ninkasi Brewing is nationally renowned, and Hop Valley Brewing and Oakshire Brewing ain’t half-bad either. There’s even a cider brewery: check out Wildcraft Ciderworks. Then there’s local standby Sam Bond’s Garage, our absolute favorite Eugene watering hole and music venue. Tacovore offers an amazing selection of, you guessed it, tacos, with all ingredients locally and sustainably-sourced. There are plenty of more traditional Mexican restaurants and food carts too, and even a large Mexican supermarket. Izakaya Meiji, where “East meets country and western,” may be the world’s only American-Western-themed Japanese whiskey bar and restaurant. Wandering Goat is Eugene’s premiere organic coffee roaster, and New Day Bakery offers excellent pastries, breakfast food, and a solid cup of joe. Not surprisingly, real estate in the Whiteaker’s heart is becoming more expensive, but prices along the outskirts are quite reasonable. Just try to keep a bit of space between yourself and the very busy 6th Avenue, one of Eugene’s central thoroughfares. If you want to be close to the action but not in the middle of it, with easy access to downtown, the Jefferson Westside neighborhood just south of here is your best bet. As you’re likely aware already, the University of Oregon is a huge draw for many people relocating to Eugene. It’s Oregon’s top public university and home to almost 25,000 undergraduate and graduate students. If you’re moving to Eugene to pursue a degree or work at the university, we’re guessing that you’ll want to be close to the U of O but not too close. Land in the West University neighborhood or the area immediately south of the U of O, and you’ll have to deal with steep prices, an itinerant student population, and frequent parties. That means the Fairmount and Amazon neighborhoods are likely your most attractive options. In the case of Fairmount, the U of O is just blocks to the west, but student rentals aren’t nearly as predominant as in other locales. Instead, you’ll find plenty of working families, professionals, retirees, and of course university professors and other UO employees. The Fairmount neighborhood has plenty else going for it too. The corner of 19th and Agate features a holy trifecta of Eugene’s finest ice cream parlor (Prince Puckler’s), patisserie (Sweet Life), and Italian eatery (Beppe and Gianni’s Trattorria). In the warmer months, there’s even a weekly Farmer’s Market. But Fairmount’s main attraction is probably the sprawling Hendrick’s Park. Occupying 80 wooded acres, it’s a popular destination for city residents looking for a bit of seclusion and its world-renowned rhododendron garden. There’s plenty of desirable real estate surrounding the park, though expect prices toward the higher end of Eugene’s market. There’s a certain forward-looking aspect to our pick for Eugene’s number two neighborhood. Part of our job as real estate agents is to forecast future real estate trends, and we see Friendly as Eugene’s most up-and-coming spot. Investors, young professionals, and working families take note: this is fast becoming one of the city’s most-desired neighborhoods. In the past several years, eco-friendly townhouse developments have sprouted out around the neighborhood’s central hub at Friendly and 28th, adding an urban touch generally not found elsewhere in Eugene. With these developments have come food carts and increasing foot traffic to the well-loved Friendly Street Market, an area fixture, and J-Tea, a teahouse featuring some of Taiwan and mainland China’s finest loose-leaf varieties. Oh, there’s a beer cart, too: with B’s Taphouse, the good times and local microbrews flow freely, perfect for hot sunny days. Traditionally, the west side of Friendly, below College Hill, was a working-class neighborhood. There are a variety of homes with plenty of mid-century ranches and bungalows, many of them lovingly remodeled, along with pockets of larger, higher-end homes. Washington Park is one of the city’s finest medium-size public parks, and Westmoreland Park features frisbee golf, a quintessentially Eugene past-time. Shopping and restaurants are easily accessible off 18th and Chambers. Up College Hill on the east side, you’ll find older homes ranging from higher-end to luxury. With their secluded vibe, it can be easy to forget that you are smack-dab in the heart of Eugene. Downtown is just north, the University of Oregon just East, and South Eugene just south. Home prices here are bound to trend upward. When affordable starter homes go on the market here, they go fast, and bidding wars are common. Once you land here though, the neighborhood lives up to its moniker. This is a genuinely friendly, close-knit place, where backyard barbecues and sidewalk conversations are the order of the day. The Amazon neighborhood is home to many of the features that make Fairmount one of Eugene’s most-desired neighborhoods. Just a short distance south from the University of Oregon, it’s perfect for graduate students and university employees, but anyone with a family should also put this one at the top of their list. Runners and dog owners (there are a lot of both in Eugene) should also take note. The neighborhood’s centerpiece is its eponymous urban oasis, Amazon Park. Bike paths, mulched running trails (goodbye shin splints), extensive open space, a swimming pool with water slides, a recreation center and a dog park make it one of Eugene’s premiere city parks. With the later, there’s even a separate fenced area for small dogs and puppies to enjoy. Enjoy golf? Laurelwood Golf Course, the city’s highest-ranked, is just up the hill. Willamette Street just to the west features some of Eugene’s best shopping, including the much-loved Market of Choice. Try 16 Tons Cafe next door for Wandering Goat coffee beer, and crepes, then Nature’s Pet Market to treat Rover or Fido to the best. Down the block, enjoy a glass of braggot, a beer and mead hybrid, at Viking Braggot Co. then go to Capella Market, one of Eugene’s oldest and most-loved organic groceries. If you’re more toward the north side of the Amazon neighborhood, worry not–there’s yet another organic grocery store, Sundance Natural Foods, with Sundance Wine Cellars next door. On the east side, Hideaway Bakery is our pick for Eugene’s finest fresh-baked bread and pastries. During the summer, wood-fired oven Tuesdays are an occasion not to miss, with outdoor seating, live music, and unbelievable Neopolitan-style pizzas. If there’s one word we’d use to describe the Amazon neighborhood, it’s “walkability.” You won’t find anywhere in Eugene with easier access to shopping, recreation, and schools. The real estate isn’t half-bad either: prices tend toward the upper-middle end of what Eugene has to offer, and you’ll find plenty of updated ranch-style homes with spacious yards perfect for gardening. For all of these reasons and more, Amazon is our pick for Eugene’s best neighborhood. Want to look at the competition? Then check out our complete guide to Eugene neighborhoods. And just let us know if you’d like to view homes in these ‘hoods or anywhere else in Eugene or Bend.